The small town of Gatlin, Nebraska is swiftly taken over by child cultists under the direction of a boy named Isaac (John Franklin). They murder all the adults in the name of “He Who Walks Behind the Rows.” Sometime later a couple, Burt (Peter Horton) and Vicky (Linda Hamilton) are driving through rural Nebraska when they hit and kill a kid running across the road. They search for a phone which leads them straight into Gatlin and a town full of children ready to sacrifice them. 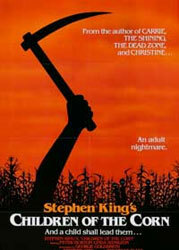 ‘Children of the Corn’ is in no way a good movie. The opening massacre with the kids doing in all the adults is a strong start, but things fizzle out fast. There is a rising tension and dread but it’s all squandered on way too much wandering around the empty town of Gatlin. It’s interesting that ‘Children of the Corn’ is such an iconic idea, but no single thing in the film is memorable at all. Isaac is suitably unnerving and somehow annoying at the same time. When He Who Walks Behind the Rows finally makes his appearance (although you never get enough of a glimpse to understand what it is) it is a big letdown.